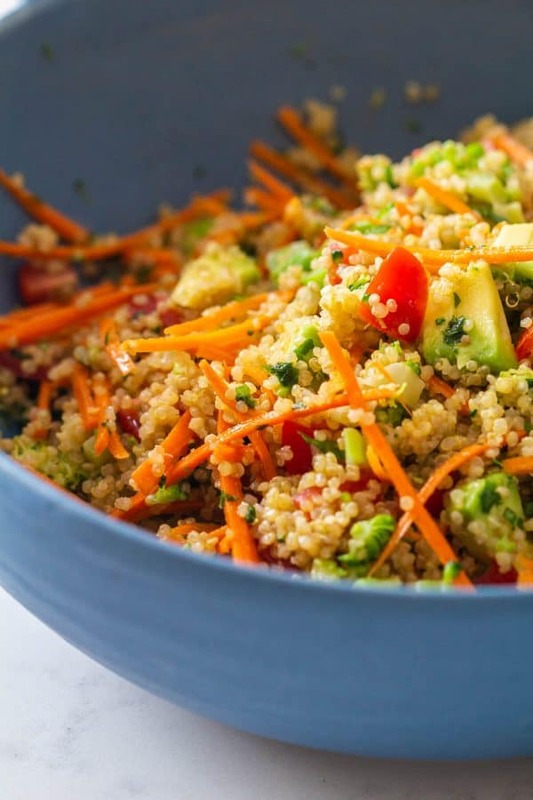 An Easy Quinoa Salad recipe to serve as side salad or as take-to-work lunch. Instructions on how to cook quinoa for salad and how long can it be stored in the fridge. After the huge – or maybe I should say gigantic – success of my Mexican Quinoa Salad I figured you REALLY like quinoa salads, eh? Here is another ingredient combo inspiration for you. To switch it up a bit but still eat quinoa salad like crazy because quinoa is LIFE! How Do You Cook Quinoa For Salad? I love how my quinoa turns out cooked in the Instant Pot, just like all other grains, too. Instant Pot Rice being the #1 best. However, if you don’t have a pressure cooker you can obviously still make this recipe. Just cook your quinoa in a pot on the stovetop as instructed on the packaging. The most important part about cooking quinoa is to remove it from the pot as soon as it’s cooked through and to fluff it up with a fork right away. The longer you leave it in a pot without fluffing the stickier it becomes. You also risk it overcooking into a big mush or sticking to the bottom of the pan. Once all the water was absorbed immediately remove it from the stove or instant pot, dump into a bowl and fluff with a fork. Quinoa salad is an amazing salad that keeps a long time in the fridge. As a rule of thumb pretty much anything cooked lats 3-4 days in the fridge as per FDA. Now, that being said, I keep dishes that don’t contain protein in the fridge for 5 or more days and they smell and taste totally fine. I’ve never had a problem with that. ALWAYS do the sniff test and if it smells remotely weird, toss it. In this particular case the recipe contains avocado so here the problem isn’t the quinoa or any of the other ingredients but the avocado. Avocado will not last in yummy consistency and taste for long. I recommend you add it to the big batch only if you know you will finish the whole salad the same day. For several day take-to-work meal prep I recommend you make the salad without the avocado and add it fresh on the day of eating instead. If you want to take this quinoa salad to work remember to add a protein to it. Add chickpeas or beans to keep it vegan or add hard-boiled eggs for a vegetarian version. You can also add cubed chicken breast or beef stripes for an meaty lunch bowl. 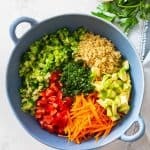 What Is The Best Dressing For Quinoa Salad? You will have noticed that most my quinoa salad recipes have a very simple dressing. 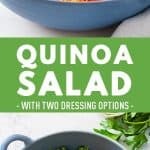 If you are here you probably love quinoa as much as I do so no need to “disguise” or “drench” it in dressing. Keep it simple. Lemon and lime go really well together with quinoa. The nutty flavor of quinoa loves the acidity of citrus. The best dressing is often simply freshly squeezed citrus, a little sea salt and pepper. However, if you want it a little fancier and super appealing for kids make a little sweeter dressing. I have yet to come across someone who doesn’t love any of my salads when served with this my honey mustard dressing. My friends just watch their kids with big eyes and open mouthes because they are devouring my salads. In the recipe card below I’m adding both alternatives for you to choose. Easy Quinoa Salad recipe as side salad or as take-to-work lunch. Instructions on how to cook quinoa for salad and how long can it be stored in fridge. Cook quinoa on the stovetop: 1:1.5 quinoa to broth ratio bring to boil then reduce heat to low, cover and simmer for 15 minutes. 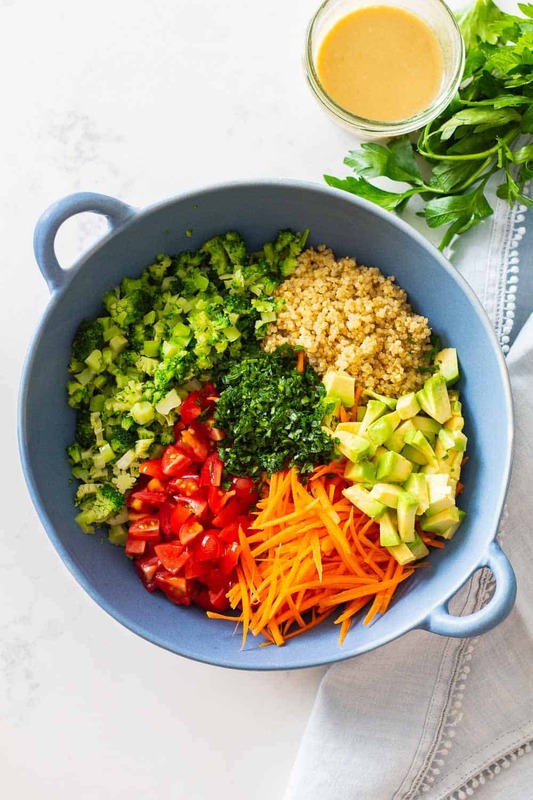 Remove quinoa from pot and add to a big salad bowl and immediately fluff up with a fork. Half, pit and peel avocado and cut into cubes and add to quinoa (if not meal prepping - for meal prep refer to blog post above). Cut up grape tomatoes in 4 or 8 pieces and add to quinoa. Peel and julienne or grate carrots and wash, dry and finely chop parsley then add to salad. Add dressing and toss salad. Simple Dressing: Add juice of 1 lemon, sea salt and pepper to taste. 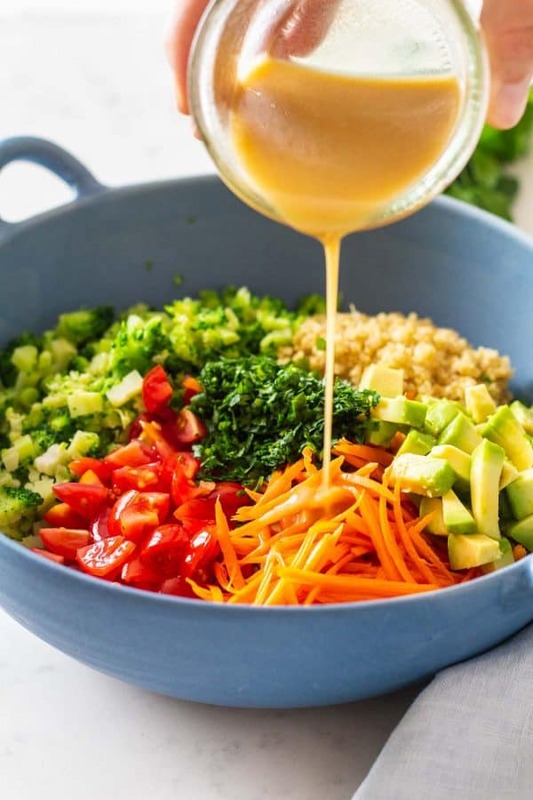 Honey Mustard Dressing: Add honey, mustard, avocado oil and 1 Tbsp of fresh lemon juice to a sealable jar and shake until silky smooth. Nutritional info with simple dressing. Add 100 calories per serving when using honey mustard dressing. Where I can find this peeler. You mean a Julienne peeler? At any kitchen store or on Amazon. I loved the salad….. How to cook broccoli? I’m glad you liked it :) You can either use frozen and simply defrost in a pan or you can cut a fresh one into florets and boil them for about 5 minutes or until desired consistency.